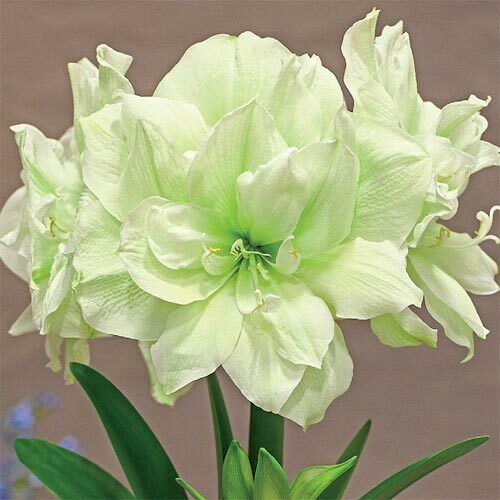 Irresistible white double blooms with a light green cast. Amaryllis: the very word means dazzling. These rare and unusual varieties are unsurpassed for their exotic beauty. Imagine doubling the beauty of an Amaryllis—these new varieties are colorful and long-lasting. All will flower for Thanksgiving or Christmas and are easy to grow indoors, providing colorful beauty during the winter months. Wonderful as holiday gifts. Each bulb produces 1-2 stems, each with at least 4 flowers. Bloom Time Wintertime as a house plant. 81/2 double, funnel shaped with large perianths. Wide strap-like fleshy leaves begins its growth during and after flowering. Plant with 1/3 of the bulb above the soil line. 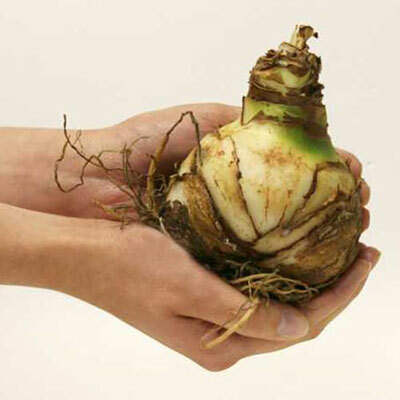 Reduce the amount of water around early August, allow bulbs to ripen and go into a dormant state for 6-8 weeks. Bring out of cool dark storage after 6-8 weeks to begin growth.